Hedge Fund Hype, Wall Street Horoscopes, and Drop-Top Jets: The Magical Minds of the “Radical Rich” | "Global Possibilities"
Strange stories from the newswires: Thousands of Wall Street traders subscribe to “financial astrology” newsletters. A series of wealthy Americans erupt into rage-filled public outbursts. Mitt Romney wonders why you can’t open a jet’s windows in mid-flight. This isn’t an episode of the X-Files. These seemingly unrelated stories are part of a larger pattern. What appears to be a sudden epidemic of magical thinking actually reflects something else: the rise of a financial sector whose economic incentives have tilted away from core business competencies – and toward something like that looks a little more like madness. The financial sector, which historically has captured roughly 20 percent of the nation’s profits, has returned to its bloated pre-2008 level of forty percent or so. Financial firms and takeover groups like Bain Capital are increasingly represented among the nation’s wealthiest households, including the Forbes “400 richest” list. Ultra-high wealth individuals are capturing an ever-increasing percentage of our nation’s wealth, leaving even the “merely wealthy” behind. Nine out of ten hedge funds are performing worse than the stock market as a whole. This mosaic of data points illustrates an economy that increasingly rewards the wrong skills. It suggests that a growing number of rich and powerful people don’t really know what they’re doing. Their wealth isn’t based on knowledge, or inventiveness, or diligence. They’ve entered the upper-income strata through salesmanship, and an ability to manipulate the political process for their own ends. They’re good at convincing people they’re good. They’re good at getting government favors. But they’re not very good at what they’re paid to be good at – running banks, turning businesses around, or coming up with new ideas. And now they’re turning their skills of persuasion and influence , along with their wealth, toward a new project: remaking the American economy in their image. Thousands of Wall Street traders are subscribing to newsletters from “financial astrologers,” says Marketplace, which named two: Karen Starich says that 300 traders subscribe to her newsletter. Arch Crawford, a former Wall Streeter himself, publishes the “Crawford Perspectives Monthly Market Timing Newsletter” has 2,000 subscribers. Based on their subscription fees and Marketplace’s figures,Karen Starich gets $71,000 a year from her newsletter alone. Arch Crawford nets a cool half mil for his – and that’s not counting the folks who go for his “Unlimited Consulting” package, plus the “New York Hotline,” for ten grand per annum. Or the purchases from his online bookstore, which offers a texbook-like tome called Financial Astrology. Skeptical? Sure, I am. But as we’ll see, there’s reason to be skeptical of most financial “experts” too. But now we know: Their hearts may be in the gutter, but their eyes are on the stars. Horoscopes or hedge funds? Let’s look the record: Hedge funds have consistently underperformed the overall market, gaining 3.52 percent through August of this year while the S&P 500 gained 13.5 percent. Tyler Durden at Zero Hedge notes that in mid-August 89 percent of hedge funds were underperforming the S&P 500, rising to 92 percent by mid-September. That means only 8 percent of hedge fund managers are doing something right – if they are. Their results may just be blind luck. Judging by their results, most of these “Masters of the Universe” have no secret knowledge, no special expertise, nothing you couldn’t get with the flip of a coin. No wonder their fees have fallen. But with performance like this, they’re still too high. The Financial News reports that the average hedge fund managers’ take is 1.6 percent of assets and 18.3 percent of fresh earnings. More than $2 trillion is being managed by hedge funds. Do the math: That’s real money. I can’t think of any other industry that rewards its under-achievers so well. Politically-minded hedge funders like Schwarzman, Pete Peterson, and Daniel S. Loeb seem pretty hostile toward government. And yet, despite their profession’s poor job performance, it’s helped them gather a lot of cheese. When you look at hedge funds, it’s easier to understand why some Wall Streeters turn to astrology. (Wonder if anyone’s done a performance comparison?) At least astrologers reveal their methods, unlike some hedge funds, so clients can decide for themselves whether they’re tapping the secrets of the universe or just talking mumbo-jumbo. Besides, astrologers aren’t a major systemic risk. Hedge funds are – now, more than ever. A recent Rand study concluded that big banks played a much larger role in the last crisis, although they contributed to it. Now hedge funds are rushing into higher-risk investments in an effort to boost their sagging results. Because they’re moving as a herd, they could turn a relatively limited failure into a systemic shock. And as the Rand study notes, hedge funds could create a run on the banks, often lack adequate margins, and operate without transparency. Big Banks: Treasury bailed them out. The Fed gave them emergency zero-interest loans. And the Fed keeps on opening the valve on the money supply while they hog the spigot. But big banks can’t cut it on the most fundamental performance measurement: stock value. They can’t even keep up with the Dow. 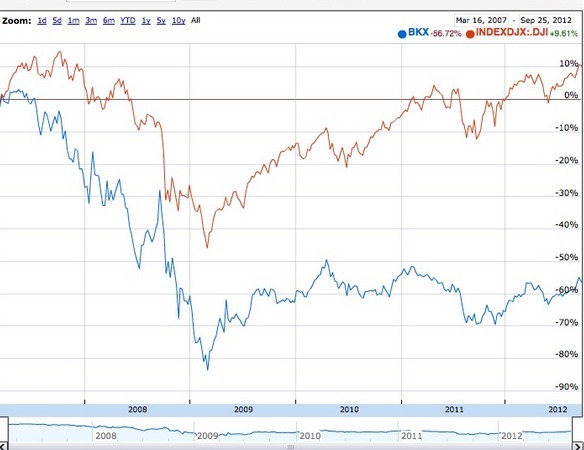 Remind me, Mr. Bank CEO: What were you saying about “the wisdom of the market”? Bernanke’s Fed is starting to look like the flight attendant in Airplane!, the one who kept blowing into an inflatable doll that wouldn’t stay inflated. But these dolls are big banks and they’re co-piloting the economy, not jet planes. “Jet planes” brings us, of course, to Romney. Most people already know that he said we should be able to open jet windows in mid-flight when we need fresh air. That would lead to rapid depressurization, of course – not unlike that which his poll numbers have recently experienced. Today we’re seeing that derangement syndrome in politics, too. From “Simpson Bowles” austerity to deregulatory market fixes, pundits and politicians are fawning over plausible-sounding proposals that are actually impractical, dangerous, or downright deceptive.Solutions? These proposals don’t even get the problems right. This Expert-Itis turns hocus-pocus into brilliance, and Washington is in its grip. Its poster child is Paul Ryan. His logic’s illogical and his numbers don’t add up, but when he turns his voodoo into charts and graphs people are wowed. If Romney had made a PowerPoint of his jet-window idea, today he’d be the toast of Washington. The pseudo-experts: They’re leaders of the new extremist rich. They’re emperors with no clothes who charge for fashion consultations. Now they want to be real emperors, leaders of nations, and they’re surrounded by subordinates and acolytes who won’t tell them they’re naked. Jets with windows that open? Yes, sir! How about a convertible? Schwarzman thinks he’s being attacked by “Hitler.” Loeb thinks he’s an exploited “laborer.” Anonymous and embittered CEOs think President Obama is “anti-business,” despite record profits and a dearth of Wall Street prosecutions under his leadership. We’ve posed this question before: Why are they so angry? Why aren’t they thanking their lucky stars – and the generosity of their government – for their fabulous wealth? Maybe it’s defensiveness, or a display of the same alpha qualities that allowed them to earn their wealth in the first place. And within a year they had their own political party. Most wealthy people aren’t part of this new, financially-propelled class of sales-driven billionaire – at least not yet. And don’t get me wrong: the new extremists are impressive, too. I don’t know of any other period in history when so many underperforming, horoscope-following, jet window-opening individuals have amassed such enormous wealth through the sheer force of their personalities and willpower. They’re dynamoes. But they aren’t the kinds of people that should run our society – and that’s what they’re after. No, thanks. I don’t want to live in a society designed by and for people who are polished at selling, but not interested in delivering; who are driven to make money, but not to create; who know how to buy political favors, but not how to work for the common good. Remember KISS? The rock and roll band? I feel pretty much the same way about this new breed of billionaire as I do about KISS: I’m impressed by their money-making ability, but I don’t want to listen to them. I admire their hustle, but I’m not buying what they’re selling. Like the guys in KISS, the members of this new billionaire breed can market themselves like crazy – but like KISS, they aren’t very good at their craft. I don’t want to live in their world any more than I want to play guitar in Gene Simmons’ band. But maybe that’s just me. Sure, I may think I reached these opinions through rational analysis, but right now a Wall Street trader is reading this and saying to himself: What else do you expect from a Leo?